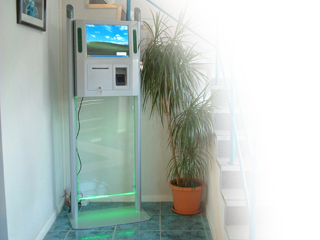 The V31 is designed to be used as either a Wall Mounted, Desktop or Floor Standing kiosk. The unit is constructed from powder coated steel and, when floor standing, utilises lit edge plastics below the main body for visual effect. As well as its wide application range, the most unique feature is the ability to simply fix the unit to a suitable wall, or use the base with poles to convert this kiosk to a floor standing unit. The v31 also offers interchangeable option panels, which provide total flexibility in the configuration and functionality. This enables the same unit to be used in many different configurations to suit all types of environments, while maintaining synergy of product, especially where high traffic and durability is a requirement. The Kiosk houses a video camera for conferencing or monitoring purposes and for unattended or external use a bullet proof TFT screen can also be fitted.